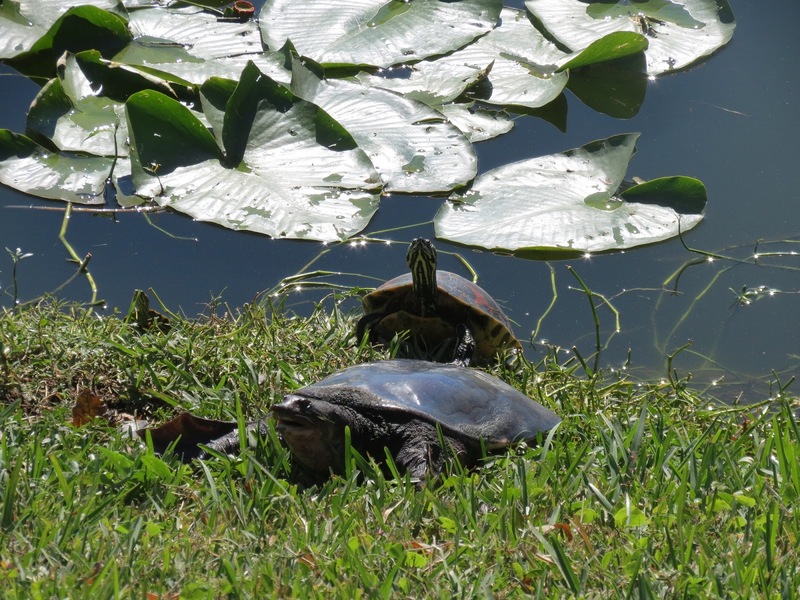 Sharing some birds and turtles from Lake Mirror in downtown Lakeland. A pretty female Mandarin Duck. A soft shelled turtle, look at that nose. Great Egret, Great Blue Heron, White Ibis and more. Koi fish at the Hollis Gardens @ Lake Mirror in Lakeland Florida. 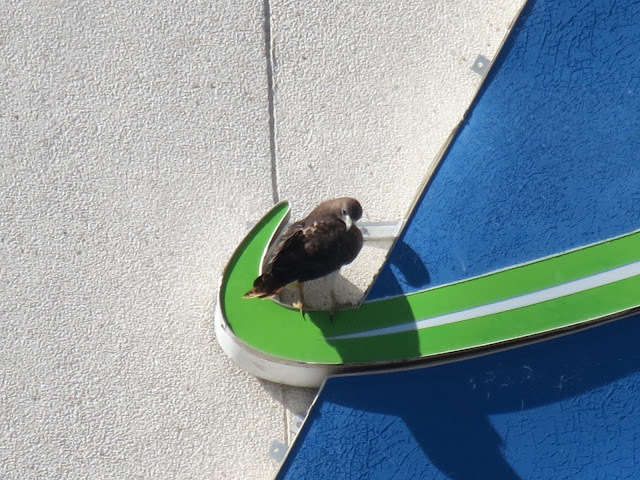 A Red-tailed Hawk on the Lakeland Electric sign. Nice photos! 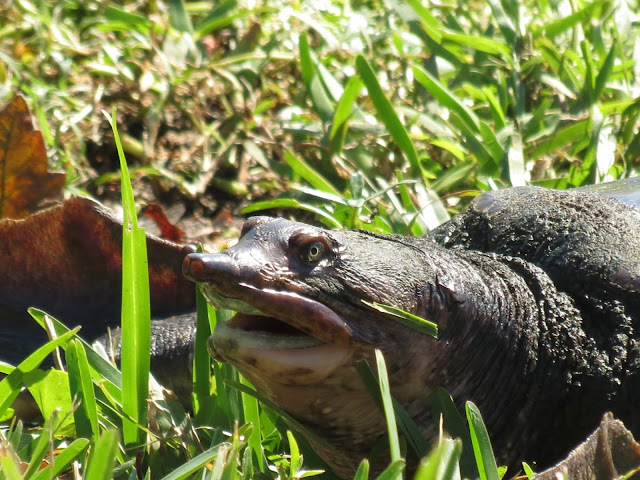 That soft shelled turtle has rather porcine facial features :-) Are those Black swans breeding there or just part of a waterfowl collection? The turtles are so interesting and the mandarin duck is so beautiful ! Have a beautiful weekend! A delight to visit and enjoy lovely critters photos. That is a pretty female Mandarin Duck and she knows that she is pretty! I like the Black Swan too! Have a beautiful weekend, Eileen. And thank you for hosting. Good Morning Eileen. The duck is real pretty - good choice of word. And if the duck is pretty then the turtle is very handsome. The bird on the sign looks really tiny. Guess it must be a huge sign? Thanks for the chance to join in today. Wonderful photos! The Mandarin duck is so pretty, and the Black Swan too. I haven't seen one of those turtles here in a long time. Used to see them quite often. Love the mandarin duck. Good morning Eileen! I find that turtle face and nose so interesting. Turtles are always fascinating. That's a great photo of the egret, heron, and ibis. Are they often found together like that? Hi Eilleen - your turtle is awesome if a tad scary! Happy Saturday and thank you for hosting. Beautiful photos, Eileen. That first picture is my very favorite! Wishing you a lovely Saturday. So nice to have a place rich in wildlife, including exotics such as that sweet Mandarin Duck. In New Mexico a small flock of Mandarins of unknown origin suddenly appeared at a State park. They never reproduced and all had disappeared within a few years. I must admit that their beauty exceeded that of our native Wood Ducks. Lovely critters for this week. Love the header photo, forgot to mention that previously. Great shot of the soft shelled turtle Eileen!!! They don't usually come out of the water!!! The sliders love to bask in the sun!!! Mirror Lake certainly has a wonderful collections of our fine feathered friends!!! Great post, Eileen. The turtles were amazing! It is a shock to see all the greenery and critters! I keep forgetting that the rest of the world doesn't have -17 C. temperatures and snow!!!! LOVED the close ups . . . I felt Mandarin Duck was so real, clear, I could touch. Great shots- the turtle looks like a monster, just a bit! Great photos. Yes, that is some nose on that turtle. I've never even heard of a soft shell turtle. Lovely collection for us to look at today Eileen, thank you. I have never seen a Turtle's face up, close and personal like in your photo ever before. Great photos! Lots of wildlife! Love the turtles. Nice series of photos - I love those turtles. I've got an unfriendly critter linked up this week. amazing soft shelled turtle!! i don't think i have ever even seen a picture of one - they are weird looking!! gorgeous mandarin duck!!! That female mandarin duck is so cute. She looks like she's smiling. Loved the photos from Circle B as well! Glad to see you're enjoying your time down south. That Lake (in the middle of a City) is so incredible. I loved visiting it. Thank you so much for hosting. If I didn't know the size of the turtle- from close up it looks a bit intimidating! A beautiful park to have all these water critters there! I really like that soft Mandarin Duck! She looks so gentle! Here I am better late than never---Your images are always very interesting. Weird nose on the soft shell. Eileen, nice collection, especially the swan. Thanks for sharing. Thanks so much, Eileen, for adding your post link at I'd Rather B Birdin' this week. Your participation is always appreciated. Dearest Eileen; Your duck has different color, naturally p:-) I'll check the species of them, sometimes I'm surprised seeing some varieties of them friendly together. Thank you so much for hosting, Have a wonderful Sunday and new week. Beautiful Ms Wood Duck Eileen. The black swan is majestic.. Wonderful photo of the little Mandarin duck and I'm sort of jealous of the lovely warm sunny florida weather you are enjoying as we are battered with storms! That is one weird nose on the soft shelled turtle! Wishing you a great day brings pleasure to our eyes. So have a great great day. Hello Eileen, happy Saturday to you! That is one incredible close up of the turtle, very nice, as are the other photos! I really am missing nice warm weather without snow and blowing wind! You are in a wonderful place! Wonderful photos - the composition of the hawk on the sign is fabulous! Happy week ahead. That nose on the turtle is something else. Black swans look so elegant. That's quite a collection! Love the black swan! I have never heard of a soft shelled turtle before. Great shots! Wow !! I really love your beautiful critters !! Happy weekend, dear friend !! great series of photos, eileen. i love those turtles. I'll be co-hosting a couple of link parties myself this week. If you have time, I'd love for you to join the fun at my place. ;-) No pressure, of course! Love the Mandarin Duck..She looks like a toy..Great shot of the Turtle..I should go visit the local Black Swans again..Happy Sunday..
Hi Eileen. Very nice pictures. You really came across a band of soft shelled turtles, the picture looks so friendly and warm! They do have funny noses! Have a great week ahead! Thanks for the close up on that turtle. I have never seen nose like that. That duck is so sweet, but that soft shelled turtle! Yikes! marvelous photos of the birds and the turtles. You catched them all very well. Boa tarde, as fotos são maravilhosas a mostrar a natureza que nos oferece a beleza, de todas qual a mais bela? What wonderful critters, Eileen. I have never before seen a soft-shelled turtle nor have I seen a Black Swan. the photos are extraordinary! I am sorry to post so late, but will try to do better. Many thanks for being such a wonderful host! I have never seen either of the first two before...amazing photos !! I love all the photos, especially those with the cute duck, and the other with the black swan! Lovely birds and turtles! I didn't realise you also had Black Swans. 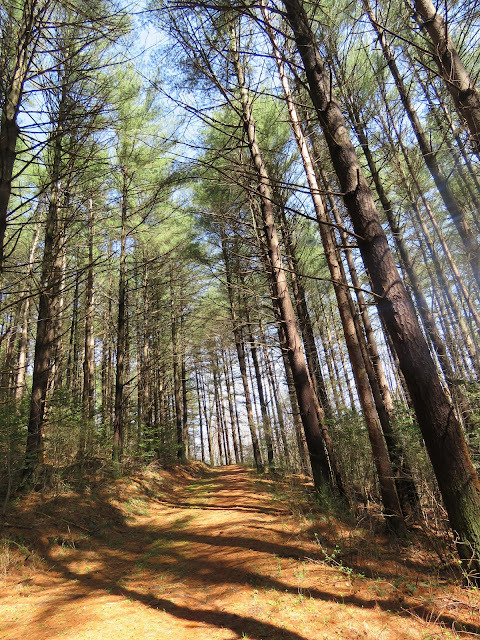 Wow, this a jackpot area for wildlife!